Posted by smithtl6 on Friday, June 7, 2013 in Courses. Catalog Description: Nineteenth century to the present. Issues of race, gender, ethnicity, immigration, and diaspora. Offered on a graded basis only. From the syllabus: This course surveys the major questions and themes of twentieth-century Jewish American literature and situates this literature in the context of ethnic writing in America. We will explore such topics such as dialect or voice, multilingualism, ethnic modernism, and racial and ethnic difference. At the beginning of the course will read novelistic accounts of Jewish immigration in the late-nineteenth and early-twentieth centuries. During the second-half of the semester we will focus on the post-World War II transformation of Jewish writing, looking at writers who have been assimilated into the American literary canon. Some of the questions we will discuss in class are as follows: To what extent should we read these authors as Jewish writers and to what extent are they American? How do Jewish writers in America straddle the divide between Jewish culture and modern American life? How have they defined experience in modern American life? 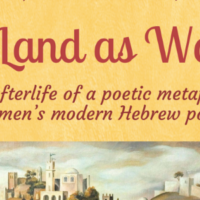 How can we relate Jewish writing to other so-called ethnic literatures? During the course of the semester, we will pay close attention to questions of immigration, gender, race, and ethnic identity.